I have been looking for a chance to bake something with berries since a while as berries are showing their heads in our farmer's market. Finally i baked this incredible bundt cake with one of my favourite berry aka Blueberry. Not to forget that i just adore bundt cakes very much. Since i got an original bundt cake pan from my cousin sister which she brought me all the way from USA, i just treasure it. 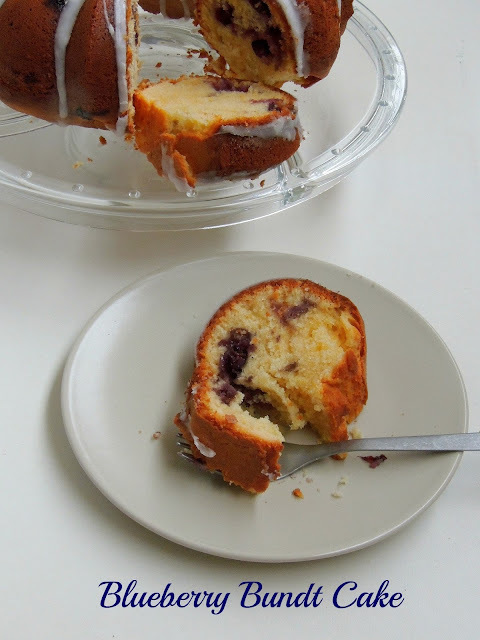 My today's post goes for a super spongy, airy, and soft bundt cake with blueberries, to make this cake more interesting, i prepared an easy breezy glaze with lemon. This is a classic bake though it took me almost a year to bake as i was looking a prefect bundt pan. Coming to this bundt cake, this cake makes an excellent dessert, breakfast or else evening snacks. Served along with a scoop of icecream, this bundt cake makes a fabulous dessert too. Actually this cake was sitting in my draft for a while and finally i got a chance to post today as am running this week's blogging marathon with Holiday dishes as theme. Since we get fresh blueberries during summer, this cake suits prefect for this theme. An excellent holiday dish to prepare, bake and enjoy with your loved ones. However i couldnt stop adding cream cheese while preparing this cake batter as i want something rich and very soft. Trust me, this cake came out extremely delicious and we couldnt stop enjoying this blueberries loaded bundt cake with our favourite drinks. 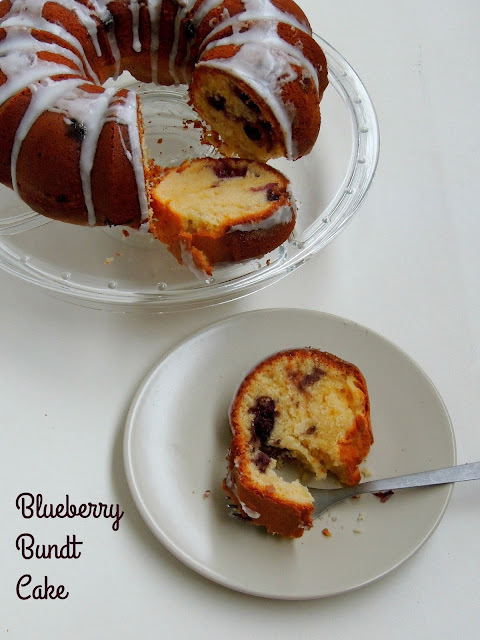 If you want to bake a fruit loaded cake, trust me you should give a try to this beautiful bundt cake. Preheat the oven to 350F and grease a bundt cake well, keep aside. Sift the flour,baking powder, baking soda and salt together and keep aside. In an another bowl, cream together the butter and sugar until this mixture turns light and pale in colour. Add the eggs one by one and beat well, now add the cream cheese, vanilla extract and beat for a while. Slowly add the sifted flour and mix well, now fold in the blueberries. Pour this prepared batter to the already prepared bundt cake pan and bake for 40-45minutes until a skewer inserted comes out clean. Allow the cake to cool completely, remove from the pan. Now prepare the glaze by adding the lemon juice a little bit at a time to the confectioner's sugar and mix well. Pour this glaze over the cake and slice it. Check out the Blogging Marathon page for the other Blogging Marathoners doing this BM#65. I love blueberry cakes and this one looks perfect with the lemon glaze. OMG... I'm drooling. It's looking so yum!! Pound cake looks delicious! Must have tasted great. Such a moist and delicious looking bundt cake. The cake looks fantastic Priya..great way to enjoy hols! Blueberry bundt cake come out so well. 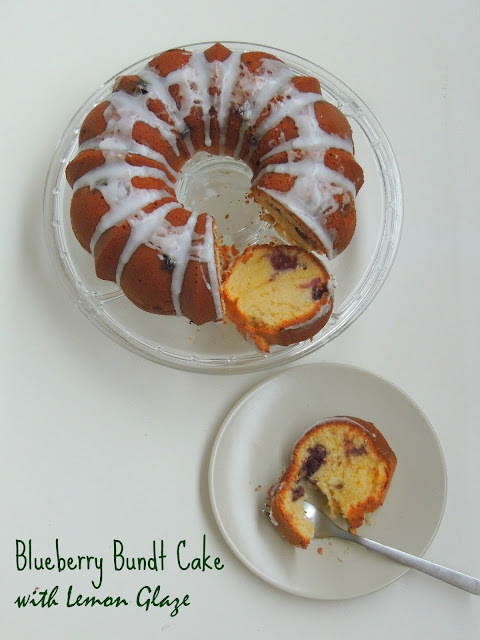 I have not made blueberry cake in a long time and i love bundt pans and the shape of the cakes baked in it.